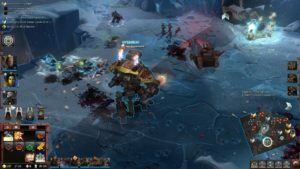 Following its release a little over a year ago, Warhammer 40K-based RTS, Dawn of War III, has (Grav) tanked spectacularly, if not from a sales point of view then certainly in terms of engagement. Within a few weeks of release, concurrent play counts fell off a cliff. Not only that, but the game’s official forums were awash with complaints, and many prominent pro-Warhammer and/or gaming YouTubers have posted videos criticising it. I reviewed the game for our sister publication, Mega Visions, and awarded it a full 5/5. Although ours was undoubtedly one of the more gushing verdicts on Dawn of War III, I stand by everything I said, and critical reception elsewhere was also generally positive. Sadly, the fan reaction was markedly less enthusiastic. So much so, that Relic’s previously mooted DLC plans were shelved earlier this year, and the future of the series is now in serious doubt. Here I used the Army Painter to create a colour scheme evocative of an old, yellowing Japanese Dreamcast, because why not? By far the community’s biggest bugbear has been with the single, MOBA-inspired multiplayer mode the game shipped with: Power Core. Power Core’s objective is to destroy the titular globe in the middle of your opponent’s’ base, after taking out their Turret and Shield generator beforehand. Combine this with other MOBA-like mechanics such as having to select up to three – oftentimes micro-heavy – Elite superunits and a loadout of passive army abilities, and you have a game mode which, on the face of it, appears to be a far cry from the rigid RTS structures of old. But here’s the thing: as an RTS fan of over 20 years, I feel more than qualified to state categorically that Dawn of War III feels very much like an RTS, not a MOBA. Most team games of StarCraft, for example, involve a push/pull game of cat and mouse which typically lasts until one side steamrolls the other. Even in Power Core mode, Turrets and Shield Generators are placed natural pinch points, which would be hotly contested with or without their presence. The cores themselves are inside the enemy base and far too sturdy to snipe, so by the time they are a viable target, the victor is all but decided anyway. Indeed, having a focal point such as this means that you no longer have to waste time mopping up every last structure or unit. Relic attempted to backpedal some of these changes with what it dubbed the Annihilation Update, which removed as many MOBA-related gubbins as possible, albiet only for custom games – not that this would have proven too bothersome, given that matchmaking was barely functional by this point anyway due to a lack of players. Sadly, it did little to reverse the game’s fortunes. Taken from the same mission I played at EGX2016, before the game released. As it turns out, it was an excellent choice, as it really showcases the game at its best: steamrolling an enemy as the Space Marines. Secondary to these misgivings were concerns about the game’s aesthetic, specifically, accusations that it was neither grim nor dark enough to be a legitimate part of the grimdark. While it’s a lot harder to argue against people’s perception’s of a visual style than is their fundamental misunderstanding of its gameplay mechanics, I still do disagree for the most part. Sure, Gabriel Angolos’ somersaulting in power armour was a bit much, but the game is absolutely brimming with personality. I particularly enjoyed the voicework, which is by far the best in the series, and while you could argue that some gameplay mechanics (such as cover) are simplified, the net result is that you feel more in control of your units than in any previous Dawn of War game. While doing away with much of the background number crunching does arguably make the game less tactical, it pays dividends in terms of making combat far more dynamic and satisfying. Also, the single player campaign was, I thought, a solid effort. While not without its issues as regards pacing (it took far too long to set up an economy in the later missions), the story was engaging and the objectives varied. I’ll admit that I wasn’t keen on the idea of automatically being passed between the three available factions at first, but the Orks weren’t as annoying as I thought they’d be. In the end, they provided some unexpected comic relief, and a nice break from the power armour-clad self-righteousness of the Space Marines and Eldar. But what it really boils down to is this: as I said in Mega Visions, the original and most fondly remembered Dawn of War is 15 years old now, and released at a time when traditional RTS still enjoyed wide currency; the first StarCraft and WarCraft III had healthy competitive scenes, Command & Conquer was still a thing and Supreme Commander, with its (at the time) unmatched sense of scale, felt like the next big thing. Since then, MOBAs happened, and while real-time strategy still has a small number of standard bearers, most of what remains in that space necessarily has to borrow from the hugely successful genre it created to stay relevant. Fans expecting anything less were setting themselves up for disappointment. And they’ve probably killed Dawn of War. Mark my words, as much as I’d be onboard with it, a pure, undiluted RTS experience bearing the Dawn of War name is never, ever coming; too much has changed in terms of both consumer trends and how games are monetized for such a thing to ever be greenlit. 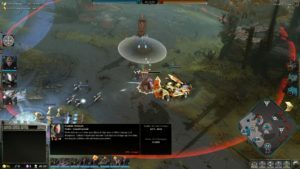 The closest you’re ever going to get is the original Dawn of War‘s still active mod scene. SEGA are an increasingly large player in the PC strategy space, and we can safely assume that they can’t have been happy with this latest installment’s performance. Warhammer, in both it’s sci-fi and fantasy flavours, is one of the genre’s holy grail franchises, and a few short years ago it seemed like an enormous coup on SEGA’s part to own the creators of both Dawn of War and the then-unannounced Warhammer: Total War games. While the former may now be forever committed to the annals of the Imperial Archives, Creative Assembly‘s fantasy empire-building series is going from strength to strength. Regrettably, this may well be the closest we’ll get to more Dawn of War in the future.